Narsis is built along the shores of Lake Hlaalu, which takes a decent portion of the Redolent Loam. Much of the land is open, with rolling hills going further southeast then in the northeast where it would eventually lead into the Obsidian Gorge, a mountain pass that is used for trading. 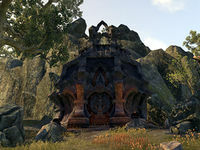 Narsis is at the pinpoint of several branching routes that go into multiple directions, both roads going to the east all lead into the city of Mournhold, while the north, across from Lake Hlaalu leads into the town of Serkamora and the region of Stonefalls. Finally, in the southwest is Malak's Maw, a mountain pass that cuts through the Valus Mountains and into the Nibenay Basin. The town of Muth Gnaar is a significant settlement, known for housing the Tear of Saint Veloth, one of the many holy artifacts of Veloth found in the Deshaan Plains. Narsis is neighbored by several settlements, including Heimlyn Keep in the northwest, and Old Keep in the northeast. Narsis was among the original settlements created during the Exodus to Resdayn, led by Saint Veloth. Originally, the town was called, Narsis-Where-All-Fervently-Praise-the-Prophet-Veloth. But as time went on, the settlement had grown into a fully-fledged city, and the name was shortened to Narsis. 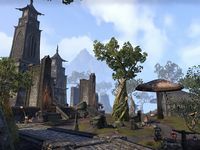 At one point or the other, Narsis had been established as the ancient capital of House Hlaalu, one of the traditional Great Houses of Morrowind, to which it has remained so since. The Chimeri armies of the Battle of Red Mountain were initially stationed at Narsis, before heading north into Red Mountain in 1E 700, where the Dwemer were gathering. On their way to Red Mountain, the Chimer and the Nords under the command of Wulfharth fought each other. The outcome is unknown but the Nordic forces, along with Wulfharth had perished amidst Sun's Death. In 2E 559, the Dark Elves of Narsis waged war with House Dres of Tear, to gain control of disputed territory found on the border near Black Marsh. House Hlaalu wanted to establish a trading post in those lands, but the Dres were just as determined to prevent that. The Hlaalu workers building the settlement were suddenly ambushed by House Dres. A small group of Hlaalu guards, under the command of Purilla Falen, were quickly able to protect the workers, fending off waves of Dres mercenaries until she was the last one standing. Finally, Hlaalu battle-merchants were able to storm the Dres mercenaries and claim the outpost. During the Interregnum in 2E 582, Narsis was afflicted by the Llodos Plague, a ravaging plague that eventually turns people into violent husks. Narsis was among the largest victims of the plague, at the time being under the rule of Councilor Ralden. The plague had, in fact, originated in Narsis, with testing occurring in Serkamora. The Maulborn, a radical group against the Tribunal had dumped vials of the Llodos Plague into Lake Hlaalu, poisoning the water supply of Narsis. This caused the city of Narsis to shut down and prevent people from either entering or leaving Narsis. Councilor Ralden had issued the help from the Morag Tong and an adventurer to investigate the situation. A Maulborn agent, incognito as a Hlaalu advisor, Giron Sadri had planted the plague in Narsis, and so he was swiftly killed in the Old Narsis Ruins. But with unrest settled in Narsis, the fight against the Llodos Plague continued into the Obsidian Gorge. In the early years of the Third Empire, House Hlaalu was originally in favor of negotiating peace with them, which would eventually become the Treaty of the Armistice. As time went on, Narsis had become the home of the Imperial Proconsul, an official that represents a consul and controls the occupied territory. However, people did not have a positive opinion on them. [UOL 1] In 3E 80, the Duke of Narsis was preparing his wedding with Galana Septim, the daughter of the then Emperor of Cyrodiil, Uriel Septim II. During the Imperial Simulacrum, the city of Narsis was under the rule of Queen Vermothah, when it had a rivalry with Mournhold. The Banner of House Hlaalu. This page was last modified on 5 March 2019, at 22:30.